This lesson is a great introduction to playing rhythm guitar as part of a larger repetoire of heavy metal techniques. The strumming patterns we're about to learn should be seen as the foundations you'll later build upon as you learn other metal rhythm techniques (palm muting, tremolo picking etc.). Throughout this lesson and the next, I'll be showing you examples of various strumming patterns and you'll also have some drum tracks to put what you learn to practice. Enjoy it! The first thing we need to master is down strumming. As the name suggests, this is simply where you hit the strings with your pick using a downward motion. This technique gives us a punchy attack, hitting those bass strings with the most force as your pick strikes them. In the exercises we're about to look at, we're simply going to use power chords. I'll tab out the power chord riffs for reference as we go but the emphasis will be on you coming up with your own riffs over the drum tracks. You'll notice that I actually use very little movement to "strum" the strings, since we're just hitting two strings at a time. It's mostly in the wrist. Keeping your pick sweep tight around the target strings will help as you speed up your down strum playing. Simple enough. Try it yourself, gradually speeding up using a metronome to keep time. In a moment we'll try something more complex over a drum track. As you change position from an E string powerchord to an A string powerchord, you'll need to reposition your downstrum attack so the first string you hit is the root (bass) string of the powerchord. Remember, if you can't keep up with that drum track yet, use a metronome first to speed up gradually and ensure you're "string targeting" is accurate. You'll most likely recognise the patterns we're about to look at as they are used a lot in metal. However, with the drummer adding his/her own beat and the guitarists writing their own riffs, they will never sound rehashed. Think of them as fundamental ingredients which you should build on and make into your own. So, slightly different from before as this time we're grouping our downstrokes into triplets (with the exception of that opening couple of strokes). As the tempo of this pattern increases, you may find you need to use upstrokes - more on this in part 2. 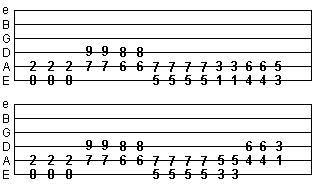 Now let's try a slower, more lumbering riff, which makes use of looser, sparser strumming patterns. Ideally, you won't be relying too much on the tabs in this lesson, because I really want you to experiment with your own riffs, and explore the rhythm techniques we've been looking at. There's one last down strumming pattern we should get to know before we move on to part 2. So, without a tab to show you what to play, try and come up with your own riff over the drum track below, and see if you can fill out those sub-rhythms accurately. I hope this lesson has helped you become more confident with your rhythm playing in heavy metal. It's now time to move on to more complex and quicker strumming patterns that involve both up and down strokes.